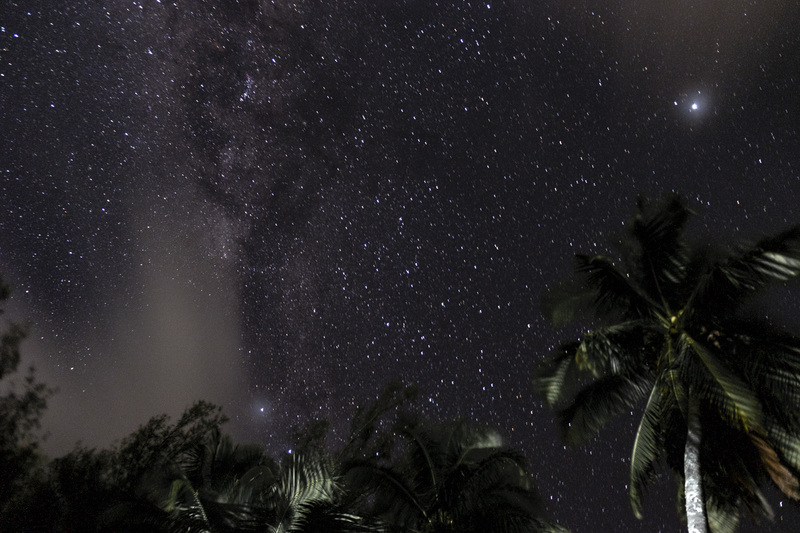 We are just back from 2 amazing weeks in the Cook Islands. If you don’t know where the Cook Islands are, take a look at your world globe and be prepared, you might need your glasses to find them! In the South Pacific, locate the French Polynesia and the Fiji islands and right in between, you’ll see a few dots that are the Cook Islands. There are 15 of them but you’ll see only 4 or 5. Rarotonga being the largest. We are from Canada and most people here have never heard about this tiny country. It’s so far. So secluded. So authentic. So for our 10th year anniversary, my husband brought me to the Cook Islands. It was my dream place, I must say. I’ve been dreaming of this little piece of land since I was a kid and this summer, my dream came true. We flew to Rarotonga! Since it was quite a long trip (21 hours from home to destination) and because it was our anniversary, we decided to go just the two of us. At 3, 5 and 7 years old, I guarantee that our children were more excited about spending two weeks with their grandparents from Québec than they would have been to follow us in the Pacific! But here’s the deal. We are not the kind of people who can afford to travel to such a foreign and exotic place. I had to find the best deals on flights and hotels to make this happen. And I think I found it all. 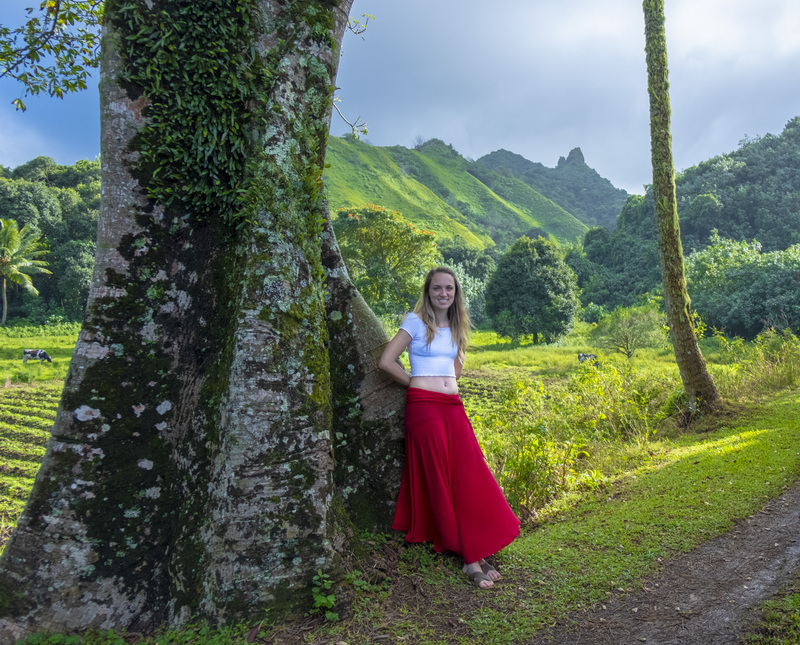 So I’m gonna share with you my tips on how to travel to Rarotonga on a budget. We flew with Air New Zealand from LAX to RAR. It’s a 10 hour flight and it was great. You can read about our experience with Air New Zealand here. The cheapest places to stay are definitely hostels. 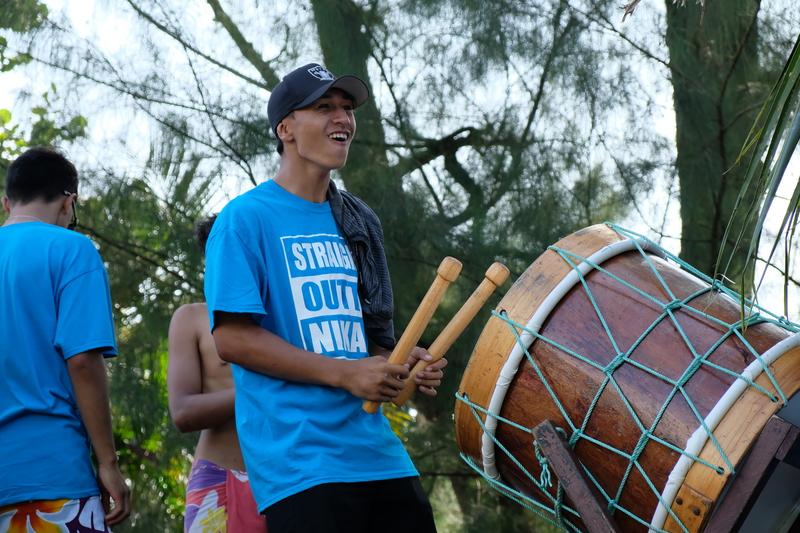 There are two main ones in Rarotonga: International Backpackers and Rarotonga Backpackers. International backpackers: The cheapest accommodation of the island! You can sleep for as cheap as $18 NZD per night in a dorm and $33 NZD for a room. We decided not to stay there because we were looking for something a little more romantic and this is not what this hostel is about. We had the chance to visit the place since we made a friend who stayed there and.. honestly.. we were glad we chose the other hostel. It’s just much much nicer. Even if it’s a little more expansive. It was worth every penny. When we got there, the lady at the reception desk was kinda rude. She yelled “Who’s in that car! ?” when she saw that we were not coming out immediately and then she kept swearing as she was talking with us. The general look of the place is old and doesn’t look very well maintained. It’s a little far from the beach (well.. it’s a 5 minute walk). It’s not a bad hostel, it was just not what we were looking for. 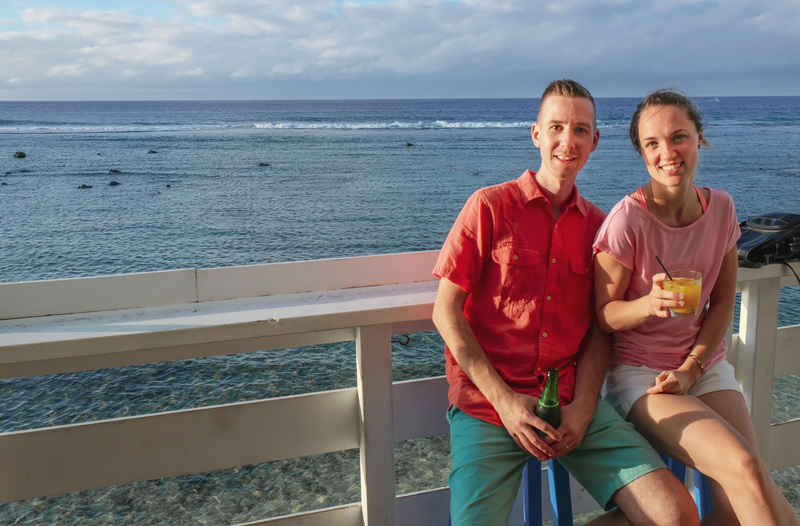 Rarotonga Backpackers: Very different than the other hostel. Actually, it’s the best hostel we’ve ever stayed in! Located directly on the beach, you can choose from many different type of room to suit your budget. Dorms are $25 NZD and their most expansive room is $130 NZD for a private room in a beach bungalow. When you know that hotels around are asking for $200-$300 NZD and more for an “on-the-beach bungalow”, we really jumped on this deal when we found it. Other good points are: In-ground pool, close to many restaurants, bus stop nearby, Paul at reception was very friendly and helpful! The Black Pearl at Puaikura: Since it was our anniversary, we also stayed in a hotel for half our stay. It was a really nice and charming little hotel but if you wanna stay on a budget, the hostel is definitely enough! It was this small hotel on the Sunset Coast called The Black Pearl at Puaikura. There’s only.. what.. 12 rooms I think all located around a beautiful swimming pool. The beach is not even 100 meters away on the other side of the street. But like, directly on the other side of the street. There are no building between the hotel and the beach, just a very-easy-to-cross street. So it was perfect for us! Plus, there was parking for our car, the “grocery” was right next door so we would go every time we needed something to eat (no need to plan for the week!) and there were plenty of nice restaurants nearby. On top of it all, the greatest snorkeling beach of the island is 5 minutes away: Aroa beach! 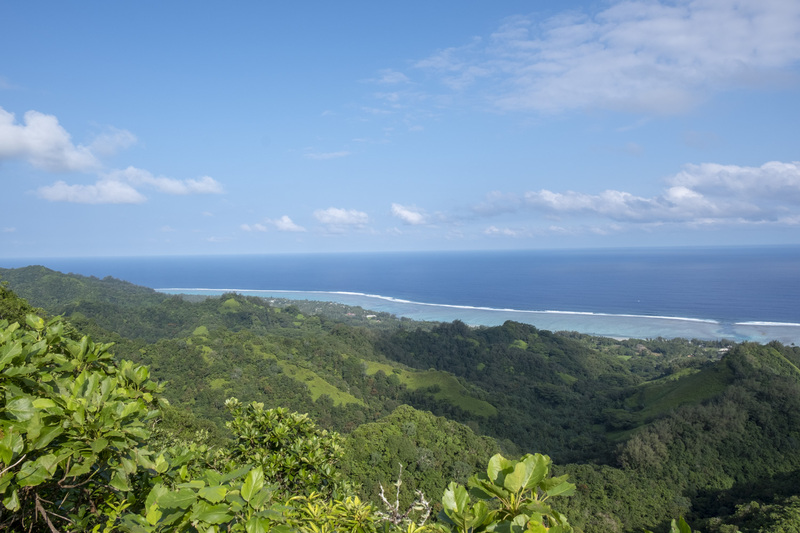 To give you an idea, Rarotonga is only 11km wide. That’s very small!!! 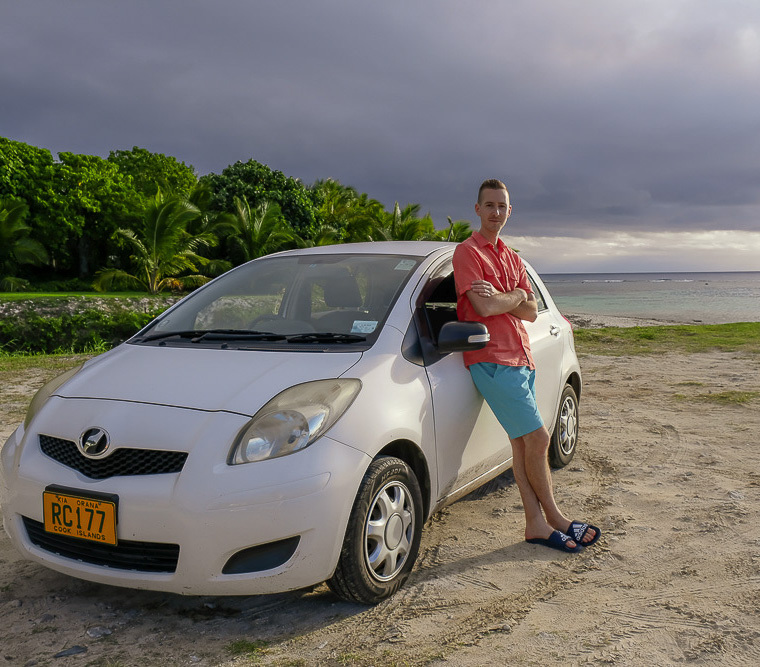 With a car, it takes an hour to drive round-the-island.You have four options to visit the island: bus, taxi, scooter or car. Bus: Cheapest transportation on the island. Buses are used by tourists as much as locals. The island is so small that you’ll find only two buses. One of them is called “clock-wise” and the other “anti-clock-wise”. They go around the island every hour (or so..) You can purchase a single ticket for $5 or buy a “concession” at $30 valid for 10 bus rides. Here’s the link to the bus schedule. Taxi: We didn’t use any taxi during the week so I’m sorry, I don’t have a lot to say about this.. I can only confirm that we saw many so lots of people seems to chose that way to go out once in a while. Scooters: Very cheap. Adventure cook islands seemed to have the cheapest rate at $27 per day or $110 for a week. To this, you’ll have to add a $40 fee for a driving test and a license (yes, everybody needs to do it!) + a shuttle fee to pick you up and drop you off at the airport. Rent a car: We had planned to rent a scooter for our two-week stay but then changed our mind last minute and it was a blessing! There were a few days of rain during the week and let’s face it, rainy days are the days where you want to go out so.. we were happy we had a car! I looked at all the renting options and the cheapest I found was Rarotonga Rentals. $528 NZD to have a car for two weeks. That’s like $470 CAD or $350 USD! We liked that. And we could pick up/drop off the car directly at the airport so no need to book a shuttle to get to the hotel. Oh, by the way. They drive on the right side of the car… Just so you know! We tried so many restaurants and groceries! Here are those worth mentioning. Wigmore’s Superstore: On the South side of the island. We thought it would be more expansive because of its’ location close to most hotels but it wasn’t. We compared the prices with a bigger grocery downtown and most items were the same price. It’s a regular grocery store where you’ll find everything you need: produces, dairy, frozen and fresh meat, wine, bathroom supply, chocolate and flowers for your hair! Kavera: On the Sunset Coast. It’s a very small grocery store that was located right next to our hotel (The Black Pearl at Puaikura) and we loved it. They had a little bit of everything: produce, meat, wine, bathroom supplies, etc. CITC Supermarket: Located downtown, it’s a massive grocery. Comparable to what we have in Canada and in the States. You’ll find everything there! Captain Andy’s Beach Bar & Grill: It was our favorite! The restaurant is part of the Rarotongan resort and it’s an over-the-water concept. Stunning! The food was delicious and they offer a different special every night. Some nights (can’t remember which ones), there’s a free drink from 5-7. Our first time there we ordered a large pizza for the both of us for.. hum.. was it $19? And our drinks were free. So $19 + free drinks.. That’s not a big bill for a night like that… But we went back a few days later and ordered regular meal and paid for our drinks (free drinks are not every night) and the bill was not the same at all! We still recommend it because for the price, you can have an amazing night. You might want to book to get a private table in a little gazebo right by the ocean. Charlies Cafe and Beach Hire: Cheap beer. Lots of young people. Nice food. Nice location. One of my husband’s favorite place! When we were there, it was a rainy night so that was too bad but we still had a very pleasant night! The Hula Bar: All day happy hour! Beer at $3.50 and cheap drinks. Over-the-water concept. Really, it’s the place to go! Located right in front of the airport, you won’t miss it. But be careful, from the road, you won’t want to stop but give it shot. The inside doesn’t look like the outside! Spaghetti House Restaurant: Good food for good price! Every time we drove by, the restaurant was full. By the way, it’s best to make a reservation if you want to try it. We didn’t want to eat spaghetti while in Rarotonga so we ignored the place at first but on our last night we tried it. It was excellent! Maybe we had enough seafood in us at this point but I remember my pizza to be delicious. I definitely recommend even if it’s one of the rare that is not directly on the beach. It’s still worth it! OTB – On The Beach Bar & Restaurant: This one is not a “on a budget” restaurant. We went there to celebrate our 10 years anniversary so we accepted to pay a little more for the occasion. If you want to do the same, OTB is an absolutely lovely romantic restaurant and the food is delicious. 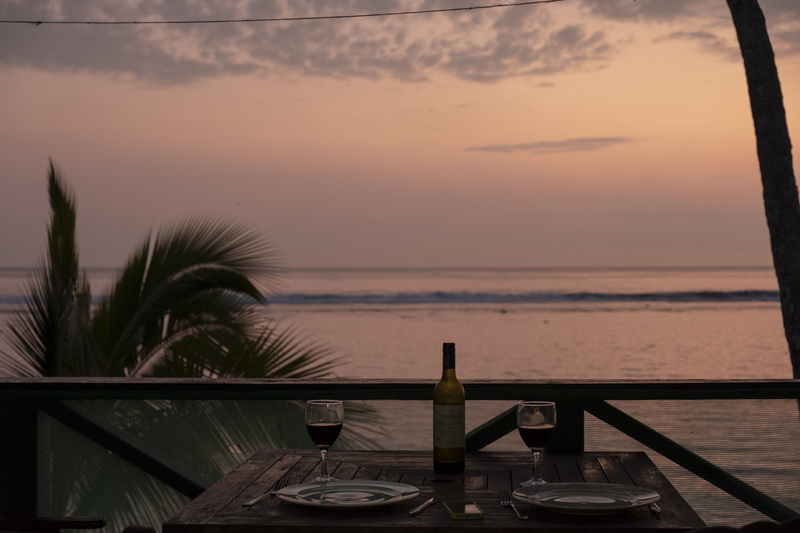 You eat directly on the beach, feet in the sand, candle on your table: the perfect romantic ambiance. I’m still following their Facebook page because I wish I could go back someday! 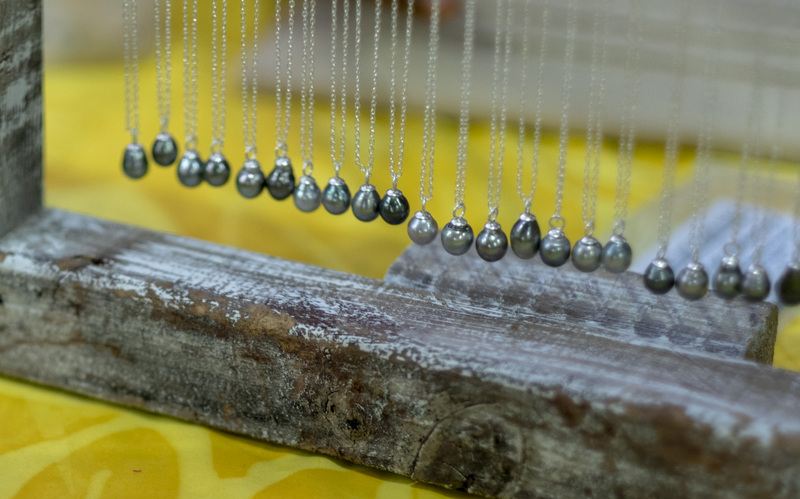 – The markets: There are two markets on the island where you can eat local food prepared in front of you. One is in town (Punanga Nui Market) and the other is in Muri (Muri Nights Market). Check out their schedule once your there because they are open only some nights but I can’t remember which ones. You can do many excursions on the island. We were on a budget so we did none of them and yet we don’t feel like we missed anything. Those are some of the free things we did. Beach: The best beach is Muri Beach. It’s one of those perfect sandy beach that goes on forever. Not a rock. Not a coral. You can walk and walk and the water will still be below your chest. Very beautiful. Although, many hotels are located on that beach which makes the place a little crowded compared to everywhere else in Rarotonga. Snorkeling: The best snorkeling beach is called Aroa beach. It’s located on the sunset coast close to the Rarotongan Resort and it’s very easily accessible (like everything on the island, really..). It’s a nice sandy beach but it’s completely surrounded by corals which makes it ideal for marine life. We spent an afternoon there and my husband had a blast! I’m not that much into snorkeling since I have this fear of the water but he convinced me to try. “Sab, it’s just soo beautiful! You have to try.” So I tried snorkeling in Rarotonga. Yes! I did! And it was wonderful! All these fish, all these colors, corals, starfish and giant clams! Man! It was amazing! I’ve heard people saying they spent hours there, head in the water looking at fish. If you love snorkeling, Aroa beach is the place to go. Rarotonga is a beautiful place! 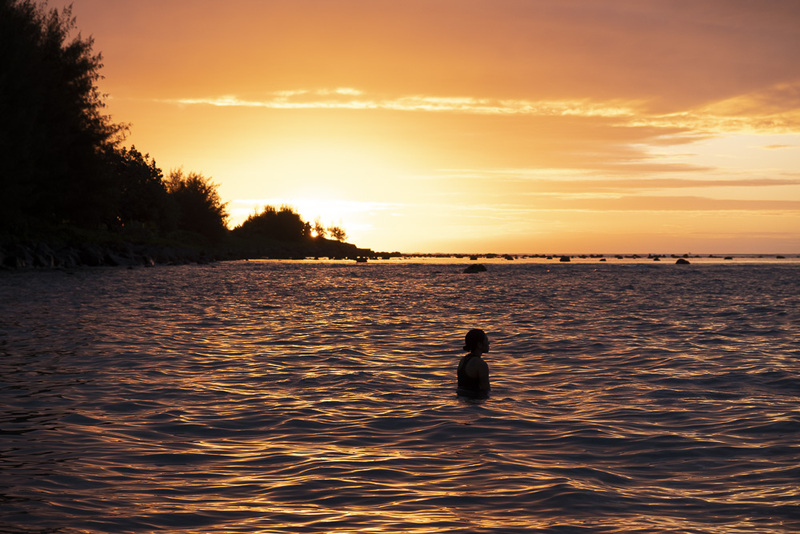 If you like secluded, rustic and exotic part of the world, you’ll love the Cook Islands. 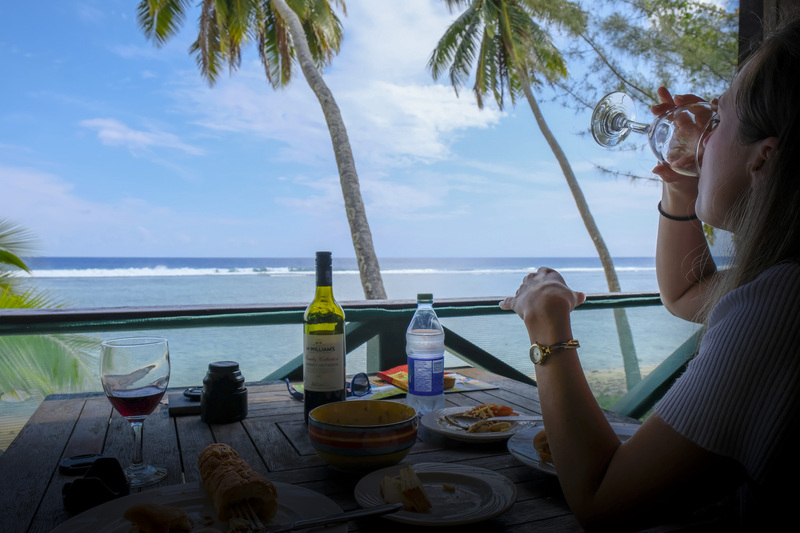 The island of Rarotonga is not “Americanized” yet so you won’t find a Starbuck there! Actually, you’ll barely find even animals! It’s true! It’s almost an “animal free island”! In town, we saw some little lizards, a few cows and goats, many dogs and hens but that’s pretty much it. No dangerous “jungle animal” even though it’s a real jungle island. Oh! The island looks a lot like the Jurassic Park Island! The same mountains and jungle. That was kind of funny. Blue starfish are all around the island! Hula Bar - For a cheap beer! 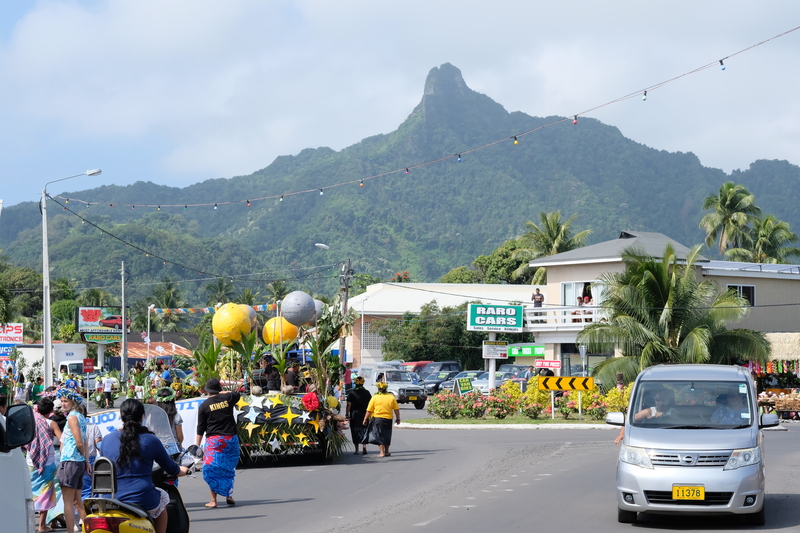 When all the islands gather together on Rarotonga for a festival!